Ralph T. Foster in his invaluable book, Fiat Paper Money, The History and Evolution of Our Currency, writes that paper money made its first appearance in Szechwan, a remote province of China early in the 11th century. Because of a shortage of copper coins, provincial officials had begun circulating iron coins; but the difference in value and weight between the two metals caused unexpected problems. As Foster writes: [housewives needed] one and one-half pounds of iron [coins] to buy one pound of salt…Paper was the answer. People began to deposit their iron money in money shops and exchanged deposit receipts to transact business. The money shops’ deposit receipts then began circulating as money. But the money shops soon issued more deposit receipts than their supply of coins and by 1022, confidence had eroded in both the notes and the supporting iron money [and] government authorities closed the private note shops. When the Chinese government intervened, the government quickly discovered the advantages paper money—at least to the issuers. The Sung dynasty immediately banned the issuance of paper notes by private money shops and on January 12, 1024, the Sung court directed the imperial treasury to issue national paper money for general use. In the beginning, the imperial treasury backed its paper notes with cash coins equal to 29% of the paper money issued. Eventually, however, the Sung, like each succeeding dynasty, would print far more money than it actually possessed in backing. For the next 600 years, succeeding dynasties would each attempt to utilize the advantages of paper money and avoid its disadvantages. Not one dynasty was able to do so. All attempts to use paper money ended in runaway inflation and dynastic collapse. Today, almost 1,000 years after paper money first appeared and 350 years after China banned its use, China’s is again issuing excessive amounts of paper money; and, once again, paper money’s initial prosperity is about to give way to inflation and economic chaos in the celestial kingdom. 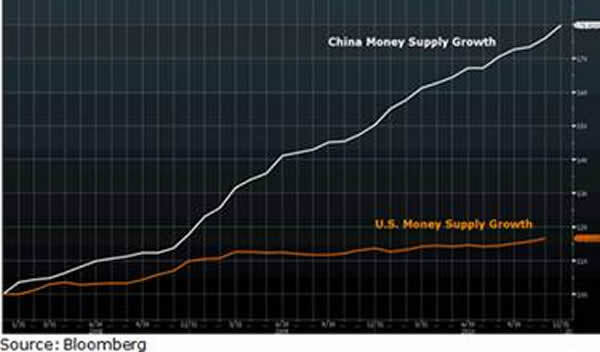 China's money supply, M2-to-GDP ratio over the past decade is the highest in the world. The nation with the longest history of excessive money printing and consequent inflation has clearly forgotten its past. The past, however, has not forgotten China. Asian nations, China and India in particular, have a long history with gold. Precious metals as a hedge against chaos is deeply embedded in Asian cultures and when chaos takes the form of inflation, gold is the default hedge; and, today, inflation is on the rise. China raised interest rates for the third time since mid-October ahead of a report forecast to show inflation accelerated to the fastest pace in 30 months. This has profound implications for the price of gold. As inflation continues to increase, the buying of physical gold by the Chinese will send the price of gold skyrocketing. In fact, it has already begun. On February 2nd, the Financial Times reported: Fears of inflation have also driven demand for gold as a retail investment… Precious metals traders in London and Hong Kong said on Wednesday they were stunned by the strength of Chinese buying in the past month. “The demand is unbelievable. The size of the orders is enormous,” said one senior banker, who estimated that China had imported about 200 tonnes in three months. On February 8th, Karen Maley in Australia’s Business Spectator discussed this growing phenomenon in her article, China’s gold tsunami: It’s not hard to understand the growing Chinese enthusiasm for gold. Officially, China’s inflation rate was 4.6 per cent in December, but many believe the actual inflation rate is considerably higher. But Chinese savers earn a paltry interest rate of 2.75 per cent on one-year deposits, which means that they face negative real interest rates. Faced with these dismal returns, Chinese households and businesses have been pouring money into physical assets, such as food, real estate, and commodities as a hedge against inflation. Chinese authorities are now trying to quell property market speculation by making it more difficult for buyers to get bank finance for their second and third investment properties, and have begun experimenting with property taxes in some cities. This has caused Chinese investors to turn to gold. According to the Sprott newsletter, China, which is already the world’s largest gold producer, imported more than 209 metric tons of gold in the first ten months of 2010 alone. This compares with the estimated 45 metric tons it imported in all of 2009. 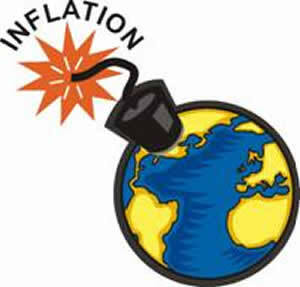 The response to the 2008 global collapse set in motion an even greater danger—runaway inflation. In 2009 world governments attempted to offset the global collapse in demand with historic levels of liquidity. The excessive printing of money has now led to higher prices. Prices, especially food prices are rapidly rising. Tyler Durden, www.zerohedge.com, makes this point with stunning clarity: One of the benefits of America finally seeing what Zimbabwe went through as it entered hyperinflation, ignoring for a second that the Zimbabwe stock market was the best performing market, putting Bernanke's liquidity pump to shame, is that very soon everyone will be naked, once companies finally realize they have no choice but to pass through surging input costs. And while some may be ecstatic by the S&P's modest rise YTD, it is nothing compared to what virtually every single agricultural product has done in the first month of 2011. To wit: Corn spot up 7.76%, wheat up 5.63%, Rice up 10.08%, Hogs up 10.16%, Sugar up 5.64%, Orange Juice up 3.33%, and cotton.... up 17.08%. That's in one month! Rapidly rising food prices have already contributed to governments falling in Tunisia and Egypt. Other governments, well aware of the risk that inflationary food prices pose to their continued rule, are now stockpiling food to prevent further protests. This buying will only drive the cost of food even higher: Jim Gerlach, of commodity brokerage A/C Trading, said: "Sovereign nations are beginning to stockpile food to prevent unrest." "You artificially stimulate much higher demand when nations start to increase stockpiles." "This is only the start of the panic buying," said Ker Chung Yang, commodities analyst at Singapore-based Phillip Futures. "I expect we'll have more countries coming in and buying grain. Even the hardened paper boys on Wall Street are aware of inflation’s impact on the price of gold. The meteoric rise of gold in the late 1970s was caused by rapidly rising prices. In the last decade, however, gold began moving steadily higher as did all commodities in a disinflationary atmosphere. That, however, is about to change. With gold already moving higher, the increasing inflationary impetus will send the price of gold far beyond its present price. Gold’s spectacular ascent in the 1970s is now about to be dwarfed. Last night, I, Ralph T. Foster, our wives and another couple had dinner together and the topic turned to the future price of gold. There was agreement that while its ascent was certain, gold’s ultimate price was a matter of pure conjecture since the reference points used to value that price would be virtually worthless pieces of paper money. History is the context within which our present circumstances present themselves. Of late, change has been so rapid that many believe the past is merely that which preceded the present. They are wrong. History is about to repeat itself, albeit in a new iteration. Paper money’s journey to the west and back again is about to reach its fatal climax. Paper money’s ten-century drama is almost over; and while a new and better era will replace it, the collapse of the present era will be unprecedented in magnitude.